Steel facing is a form of electroplating that deposits a molecularly thin layer of pure iron onto a copper plate. If done correctly, no loss of detail occurs to the plate or image. 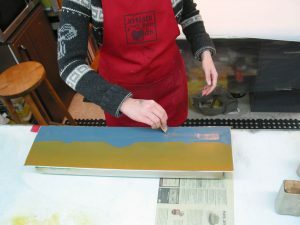 The benefit to steelfacing is the ability to print bright colours (such as yellow or white) without oxidation and the ability to print larger editions from fragile plates (such as a drypoint or mezzotint). 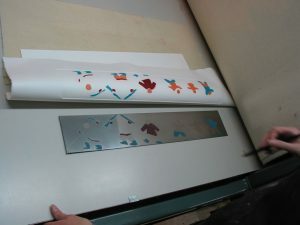 Below is the printing sequence from a series of steelfaced plates. Without steelfacing the colours printed muddy and grey or green due to the oxidation that occurs to the colour from the copper plate. 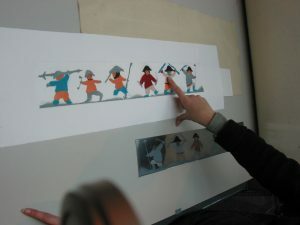 Here you can see that the colours stay vivid and clean when printed from steelfaced plates. 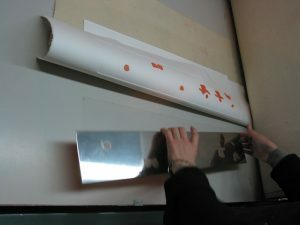 The colour orange and a transparent blue/grey being printed from a steel faced aquatint plate. Although well maintained etching presses require minimal attention, when left to sit for long periods they can rust or corrode. New Leaf offers press maintenance and repair services to get any press back in running shape. We also rescue and refurbish old presses that would otherwise be inoperable. If you have a press in need of rescuing, contact us for repair services or any advice we can provide to steer you in the right direction. We provide solid arbourite press beds cut to specified size with routered edges. New Leaf uses this blanket system daily, it saves us time, materials and money. 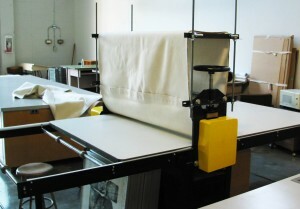 We can also fit your press and blankets with attachments for only $500 – $1200. Contact us with images of your press for an estimate. 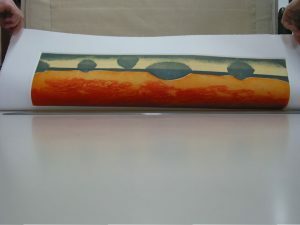 Creative challenges keep things interesting in printmaking and beyond. We offer consultation services on how to realize your vision.